Jang Sa-ik has the look of an ordinary man. Ordinary enough to pass for one of the construction workers renovating his garden as The Korea Herald interviewed him Monday. But this unremarkable impression disappeared as soon as he started singing on the rooftop yard where he was supposed to pose for the camera. Instead of saying “cheese,” Jang began to smile broadly, eyes half shut, before cranking up his voice to stage an impromptu mini concert -- modulating the rhythm, pitch and emotional reverberations with the excitement of a child playing with a newfound toy. His neighborhood is beautiful. Asked whether the scenery he routinely watches from his own living room affected his singing career, Jang said simply that “it’s good to have the background like that” in terms of sensibility. Jang’s path to becoming one of Korea’s top singers was far from simple. He wandered from one job to another -- at a dozen firms in industries ranging from insurance and electronics parts to furniture and car repairs. Throughout his non-musical career, Jang was vaguely aware of his true calling, as his early life was closely associated with music. Born in 1949 in Hongseong, South Chungcheong Province, Jang spent his childhood listening to his father and uncle playing the taepyeongso, a Korean oboe. He was also familiar with traditional music because he grew up in the countryside. Influenced by his father, Jang began to practice playing taepyeongso in 1980, but it was only in 1993 when he quit working at the car repair shop and devoted his time to playing the instrument. His decision soon bore fruit, as he won a series of music awards in the first year. The real turning point came in November 1994: Jang staged a small solo performance at a small theater near Hongik University in Seoul. He thought the show would be a one-off gig for his friends. It was not. The next year he went on to release his first album titled “Haneul Ganeungil (Passage to Heaven).” From then on, he rapidly moved into the center stage of the country’s music scene, putting out albums and staging concerts amid rising popularity. As he often wears hanbok, some assume his music is entirely traditional. In fact, his music is difficult to define -- he pieces together popular music, jazz, and traditional Korean music, including elements of a traditional style of opera known as pansori. Jang said people initially didn’t understand why he had inserted a sort of pansori narration technique into his performance. “But after I sang the songs like that for 18 years, now it’s in sync with the audience’s rhythm,” he said, adding that music should be free. He does not regard conventional rules in musical performance as important. “We don’t have to get the beat right. It’s actually easier to sing to the beat. What’s more important and more interesting is to play up to our own sensibilities,” he said. Jang explores new genres freely but he sticks to setting a new theme every two years. The latest theme is “station,” a word that Jang thinks symbolizes the fleeting nature of life. “Some people settle down comfortably, others ride the train back home. I think this is what life is all about,” he said. The station symbol involves a journey; for Jang, it was a dramatic one, particularly because he found his true calling belatedly and rose to public recognition and critical fame fairly quickly. Jang, however, does not believe in flash-in-the-pan popularity. He said Korean pop stars were riding the hallyu boom overseas, but will fade without the inclusion of something more profound -- preferably involving the Korean mind and traditions. Jang himself is eager to promote Korean music overseas. In 2007, he held concerts under the theme of “Longing ...” in New York, Chicago, Washington D.C., and Los Angeles. This year, he plans to stage a charity concert in Los Angeles. At a concert, for example, he starts off with a group of original pieces that are thought-provoking and deeply layered. The audiences, naturally, find themselves locked in the intricacy of such music. But in the second half, he opts for popular songs that are meant to release audiences’ emotions. 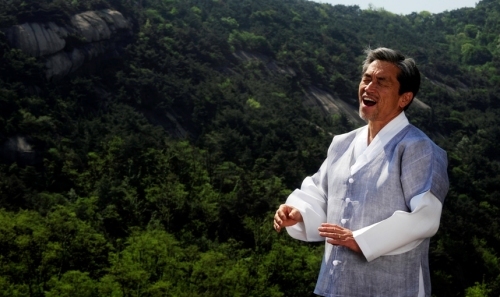 When it comes to emotional resonance among Koreans, no song can beat “Arirang.” Perhaps that’s why Jang plans to set the famous Korean folk song as a theme for 2014, marking the 20th anniversary of his musical debut. “There’s something deeply Korean hidden in ‘Arirang’ because I get truly emotional whenever I sing it,” Jang said. “Arirang” has a simple rhythm and verse, but Jang’s rendition of it on the stage to his enthusiastic fans will be nothing if not extraordinary. Staff reporter Lee Woo-young (wylee@heraldcorp.com) contributed to this report.